As some may or may not know, Advanced Micro Devices is finally ready to launch a reference dual-GPU Radeon HD 7000 graphics card. The company hasn't really released it yet, but it's getting close, and some people even have the card available to play with already. Case in point, Reddit user Repilur has posted a photo, a very blurry photo too, of his computer, a desktop with a side window. 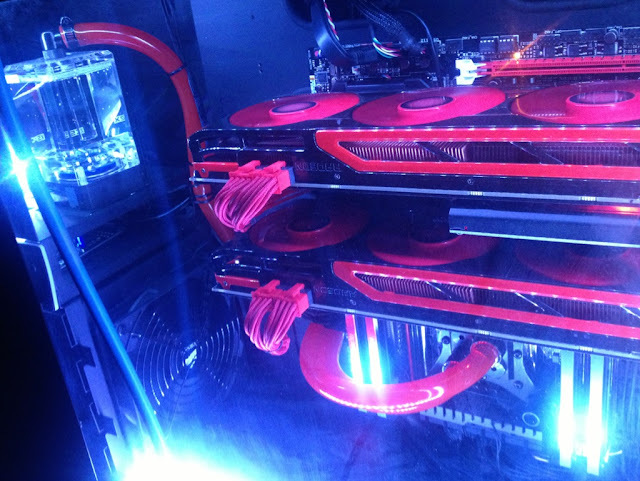 Inside, there is not just one of the Radeon HD 7990 Malta graphics cards, but two, set in CrossFireX. That means there are no fewer than four Tahiti graphics processing units working in tandem, and with a clock speed of 1-1.1 GHz per GPU and 6 GB times two memory, that means a lot of horsepower, and needed energy for that matter. The triple-fan-cooled graphics card will show up this quarter.